Is your fleet uptime meeting your customers’ expectations? Idealease knows your fleet’s uptime is critical to your customers’ success. The comprehensive and proactive Idealease Dedicated Maintenance program maximizes component life cycles, controls operating costs, and provides the highest level of reliability and vehicle uptime. The Idealease Dedicated Maintenance Program schedules and tracks your truck’s Preventive Maintenance (PM) service intervals and reminds you and your drivers when they are due for service. PMs are scheduled around your business hours, often during off-hours to reduce downtime, thereby increasing your vehicle utilization and customer satisfaction. Get your trucks back on the road fast with Priority Service from Idealease. 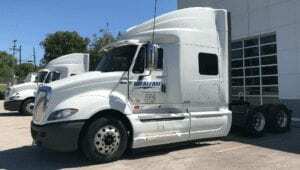 Our trucks are moved to the front of the line whether they are being maintained at a dedicated Idealease facility or an International Truck dealership. That’s an advantage no Idealease competitor can replicate. Fixed monthly costs allow you to manage expenses and simplify your budget process. You will know your month-to-month maintenance expense in advance for the length of your Idealease Dedicated Maintenance agreement. Our maintenance facilities use the latest wheel alignment tools and testing equipment to maximize tire performance and fuel economy. Our maintenance program includes the cost for all normal tire repair and replacement and optimal tire replacement intervals. To assure your compliance with Tennessee and federal regulations and avoid fines, Idealease includes all required Tennessee and federal vehicle inspections in your maintenance schedule. An Idealease Dedicated Maintenance Program, tailored to your unique needs, will improve the reliability of your owned equipment. We stock an expansive parts inventory, schedule preventive truck maintenance at optimal intervals, track repair history, and perform all maintenance for the length of your dedicated truck maintenance agreement—all to improve vehicle uptime for your commercial trucks. Improved uptime allows you to deliver on your customer promise! As the approved warranty provider for International® Trucks, we have unparalleled access to maintenance expertise, diagnostic equipment, manufacturer certified technicians, and millions of dollars of parts inventory. When it comes to servicing International Trucks, no one in the industry can match the expertise of Idealease. Because Idealease is owned by North America’s International Truck dealers, we have a close knit relationship with Navistar, the manufacturer of International Trucks. Simplify fleet vehicle maintenance and improve vehicle uptime of your owned equipment with a dedicated truck maintenance agreement from CUMBERLAND Idealease. Pay a fixed, consistent monthly cost for all predictable maintenance including PMs, brake and tire replacements and component failures. Additionally, all maintenance is performed in Idealease priority service bays by highly skilled technicians at # CUMBERLAND Idealease locations.